I want to say the answer is definitely yes. Totally biased opinion: I can’t describe how creative my little one can be. She is truly remarkable. The other day, I told her I will be working in a different company. BTW, today is my last day of working at Starbucks. Enjoyed my years there, but ready to move on the next chapter. I told her, the cafeteria in my new company serves unlimited pickles. I can bring you a pickle when I pick you up. (context: I am usually the one picks her up from school and she always wants a small piece of snack after school). Pretty much like that, non-stop. I was driving at that time, it’s hilarious and I told her, “you should write a book about it”. I almost immediately regretted it, because she started making up background of the story and more pickles coming up. It was annoying, but still hilarious; OK, I admit it, it was pretty awesome. Once we got back home, she started her project. First, the book cover. It was very impressive, I particularly love the black dots she used, over the green color she chose. It is very pickle-ry. She tried to introduce the background of the main characters, i.e. 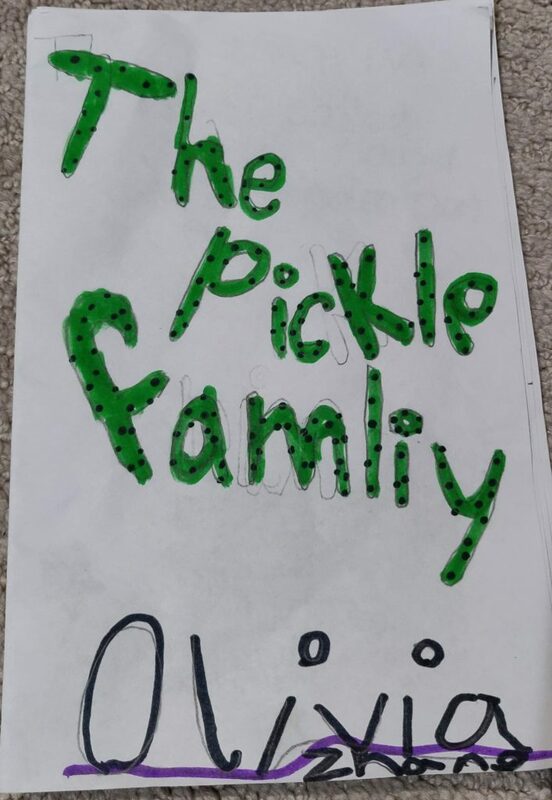 the pickle family, who live inside a pickle house. Hmm, I don’t know how that will work, but it’s kind of interesting. Then she made additional 4 pages, so basically it’s a book with 5 pages. The story is about the two little pickles go to school and then get a detention, after home, their parents are mad… but overall, the plot is completely not making sense. Every time we go to a trip and live in a hotel, she loves watching Disney channel (we don’t have cable at home), some of those shows on Disney channel are very off the chart. We just came back from a trip, it must be influenced by one of those shows she watched. Anyway, now it’s the core of this week’s idea. I love what my little one has done. It is very rough, strange, and the story is boring; however, I love it. I want to make it a real book. Interesting stuff. But I notice something: all of those providers are designed for adults. They all just offer the users to upload a picture, and then select materials, finally pay. These are all adult activities. But after I gave them a little try, ugh… not sure any child will really fall into it. When I look at my kid’s book, I can see she put the most effort in her cover page, and then the first page. Later pages became more and more scribbled. It’s easy to understand: kids can be easily distracted, become inpatient, and lose focus and interest. I want to say most kids are like that, except some gifted ones. The question then is: how do we keep the kids feeling intrigued during their work? I am a big admirer of Bret Victor. He is super smart and chill. We should have a principle for ourselves, believe in what we are doing and keep doing it. Seeing what we are working on is very important, because it provides instant feedback. Both points have made a big impact in how I work. That is it, we need an application for kids, which will provide instant feedback and keep the kids feeling interested! You can tell I am not very creative. At least older than 6 years, who can spell some simple words and use stylus to draw. 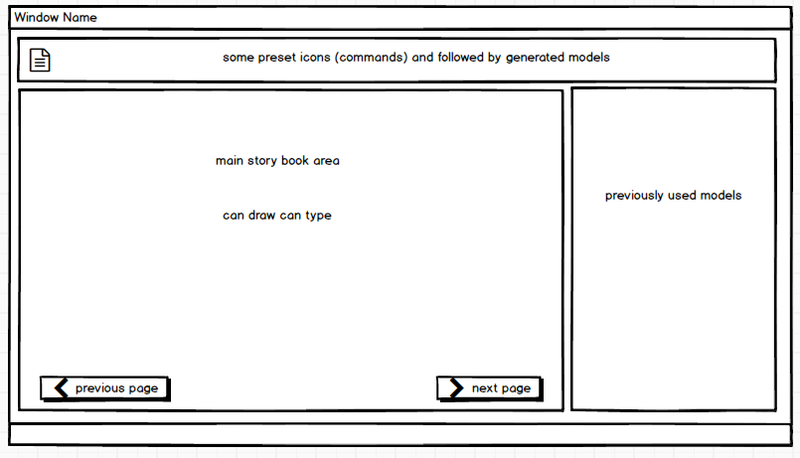 The application is designed to allow anyone to create a drawing story book with computer assistance. By computer assistance, I mean using artificial intelligence to help create characters when typing or drawing. Basically, we almost have a certain level of intelligence to understand what the user tries to draw, or predict what the user wants to draw based on text. 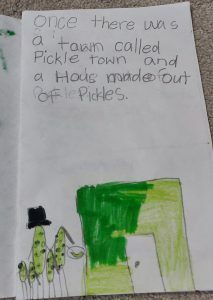 Computer will try to generate a small model of town, which matches the concept of pickle town, say having a flag with a pickle in it, or the town is all green, and so on. Computer will generate possible model of a pickle that looks like a man. If the user likes the computer generated model, they just drag to use it in the book. Or the user can draw a shape of something, computer will generate what this shape might be. The prediction can change if the user keeps adding details to it. Every model the user has used in the book can be saved to be reused later in another page. In the case the user wants the model to have a different gesture, the user can drag the existing model, starting draw shapes around it, the computer can try to predict a drawing with the existing model. If this application is initially designed to be used by kids, it needs to be very simple. It seems to be an interesting idea to run a user study with it. Author HongPosted on April 13, 2019 April 14, 2019 Tags doable, kids, user studyLeave a comment on 7th: Can kids write a book?